With over 20 years of experience we offer a 24 hour service to our customers in Northampton, Milton Keynes, Kettering and other surrounding areas 7 days a week. We are a family run team of glaziers specialising in both large and small jobs at prices that won't break the bank. At Homesecure 24hr Ltd we offer a fast and comprehensive emergency boarding up service to the whole of Northamptonshire, Leicestershire, Bucks and Beds, working with many satisfied customers in locations such as Northampton, Milton Keynes and Kettering. 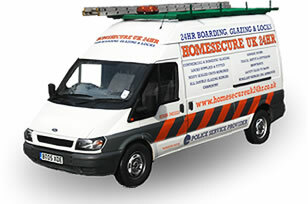 Homesecure 24hr Ltd understand that you need a fast and efficient service in your time of need and we always go above and beyond to ensure that we are offering the very best emergency boarding up service in the UK. Locally run, and with 20 years experience in emergency boarding up and emergency glazing, we operate a full 24 hour, 7 days a week service - with no call out charge, day or night. We offer a service that is second to none in the local area and take great pride in not only completing the best work but also completing it in the fastest possible time to minimise your disruption. At Homesecure 24hr Ltd we offer a fast and comprehensive boarding up and glazing repair service to the whole of Northamptonshire, Leicestershire, Bucks and Beds. We can provide a domestic glazing maintenance service as well. A service which includes every aspect of double glazing repair to all types of windows and conservatories. Such as repairs to failed misty sealed units, UPVC frame refurbishment, handle and lock replacement and even fitting cat flaps to double glazed doors. Plus for your absolute peace of mind, all our services are guaranteed for 12 months and we are fully insured with up to £5,000,000 of employer and public liability insurance. So wherever you are in the East Midlands, if you need help with glazing, boarding up, locks or with many other jobs in commercial premises, a shop or your home, Homesecure UK can provide it.